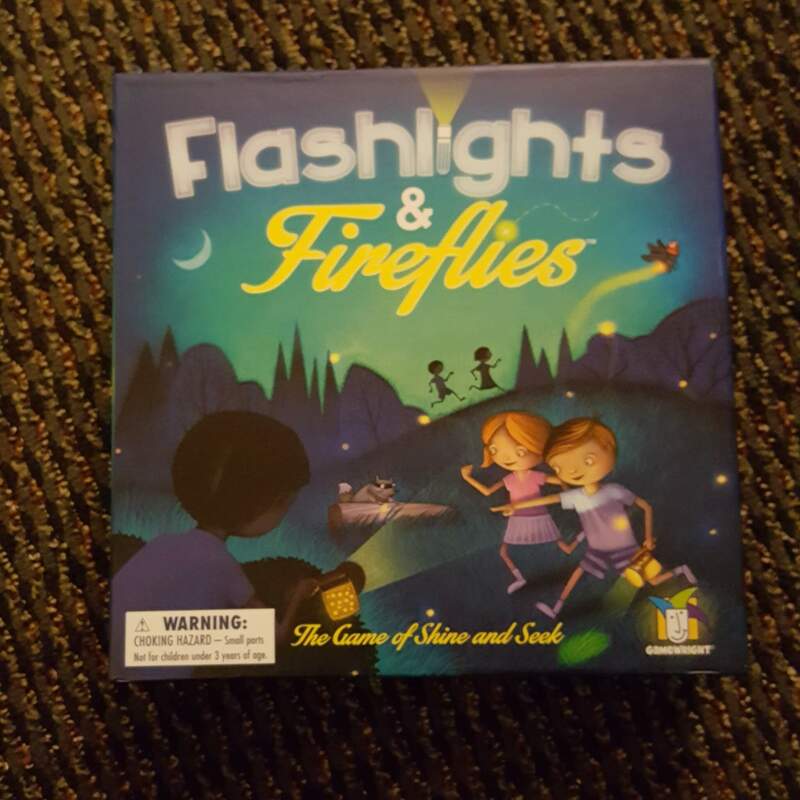 Flashlights and Fireflies is a board game version of flashlight freeze tag for 2-5 players. The game is recommended for ages 6 and up, and is published by Gamewright. In Flashlights and Fireflies, you play the role of children playing flashlight freeze tag in the woods. The game plays in three quick phases per round, and the game ends when one player reaches home. The board includes three sections; the woods, the firefly field, and the path home. Flashlights and Fireflies plays in rounds, and each round include four phases: hide, catch, shine, and sneak. In the hide phase of the round, you draw woods tiles and hide your player tile, then the tiles (four to start) are laid out face down in front of you. The woods tiles may have woods on them, or a pest that you might find in the woods. In the catch phase, each player takes turns rolling the die to determine how many firefly tokens they can draw. The firefly tokens have between one and three fireflies on them, or they can have a mosquito. A mosquito token drawn during the catch phase ends the phase for that player. 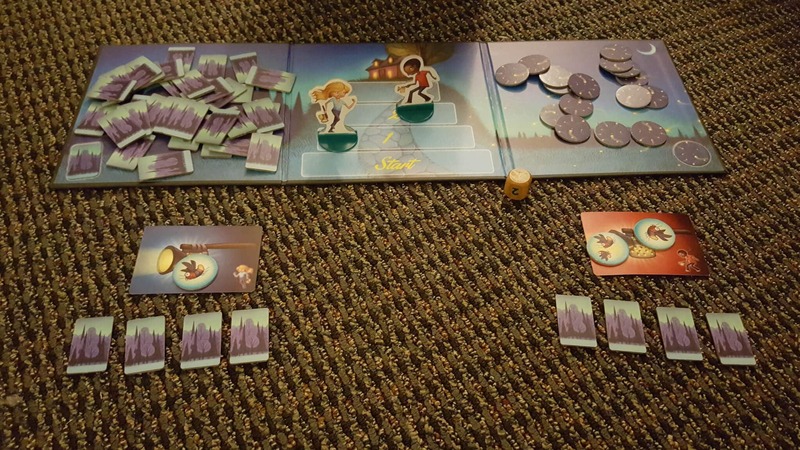 In the shine phase players take their firefly tokens and place them in front of the other players to find them. For each firefly, the player can turn over one opponent’s tile, then if a player token is found the found player is frozen for the round. If they find trees nothing happens, and if they find a pest the seekers turn immediately ends. The final phase of the round is sneak, and in this phase, each unfrozen player moves their pawn up the path one step closer to home. Flashlights and Fireflies is a great game for the whole family. The game moves quickly through each round and takes about 20 to 30 minutes to play. The age recommended is 6 and up, but since there is no reading in the game it does scale down nicely to slightly younger players. The artwork is cute, and the tokens and tiles are made of high-quality, thick cardboard. The game is fairly easy to learn and players are typically very comfortable after one or two rounds. However, it might be worthwhile to do a few rounds of practice with the youngest gamers to help build familiarity. One additional point of note is that the directions are a little wordy and can be confusing initially. Once we played it through once and worked through the phases it was much easier. For any family with younger gamers, Flashlights and Fireflies is a great addition to their collection. It has simple game play, and does a great job introducing the gaming element of rounds to younger players. The directions can be slightly confusing, but it is worth taking the time to understand the game for a quick and easy game for younger kids. Flashlights and Fireflies is a fun simple game that the whole family can enjoy playing together. Make sure you check out our other board game reviews! Xbox Game Pass Expanding to Include New Releases! Hello Kitty Kruisers is Coming to the Nintendo Switch!